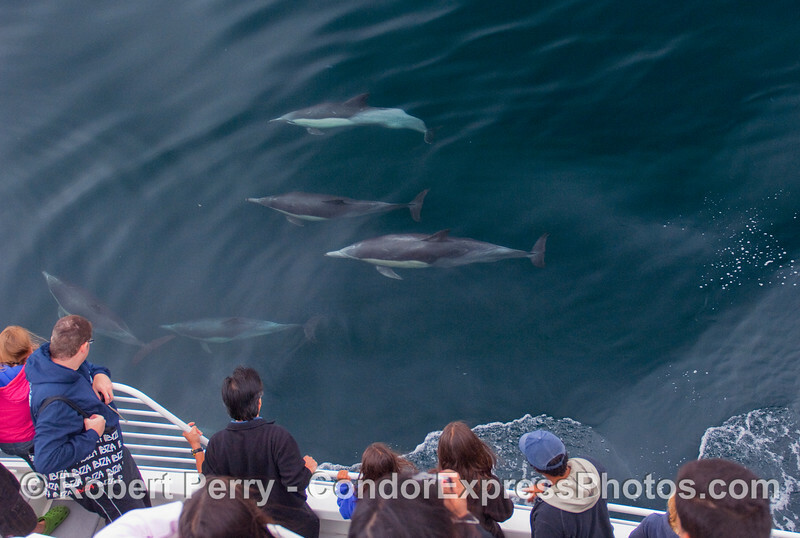 Humpback Whales (Megaptera novaeangliae), Blue Whales (Balaenoptera musculus), Common Dolphins (Delphinus capensis) and Risso's Dolphins (Grampus griseus). 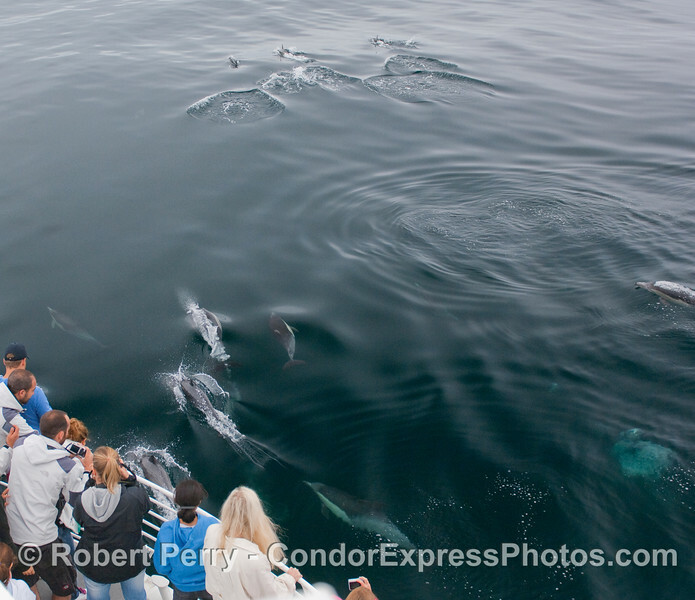 An overcast day with calm seas and a trip 40 miles southwest to the feeding grounds where we found over 100 whales spouting all around. Exhilarating! Be sure to click the "Map This" button on the upper right to see where we went: half way between Point Conception and San Miguel Island. 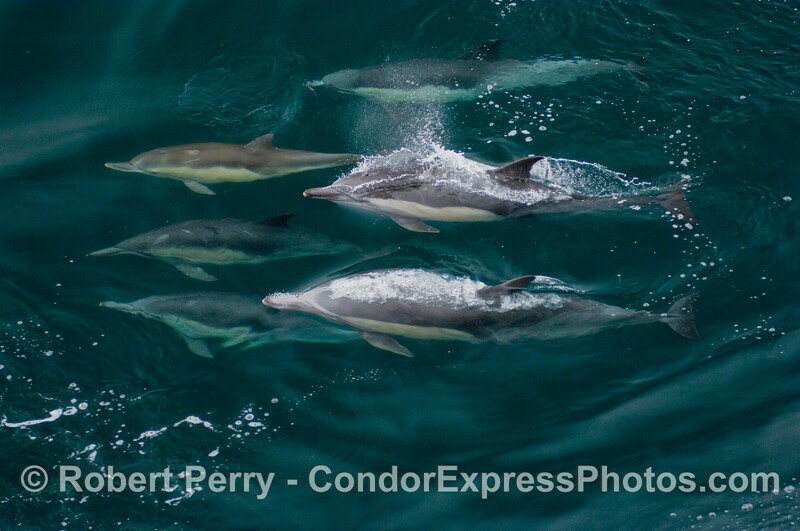 An armada of Common Dolphins ply the jade waters. Upper jaw of a Humpback Whale, full of baleen plates, sticks out of the water as the beast opens its mouth to take in a big school of krill. Image 1 of 2. Upper jaw of a Humpback Whale, full of baleen plates, sticks out of the water as the beast opens its mouth to take in a big school of krill. Image 2 of 2. 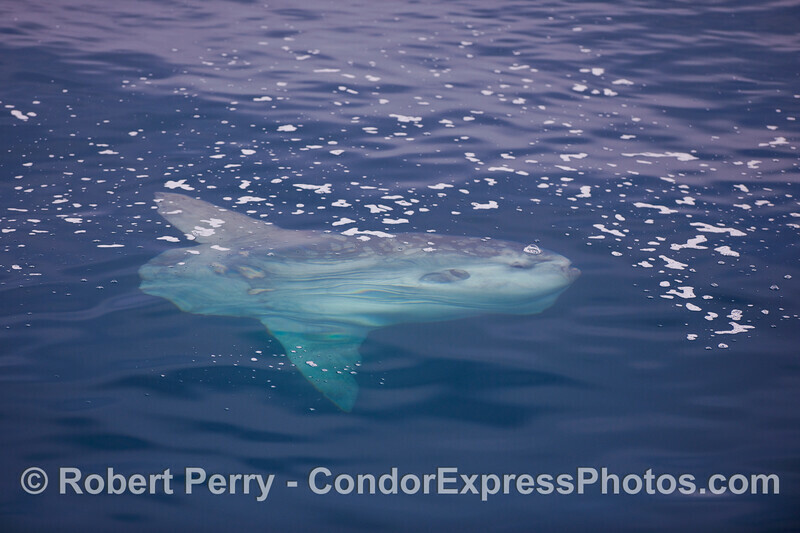 An Ocean Sunfish (Mola mola) swims beneath the surface sea foam. 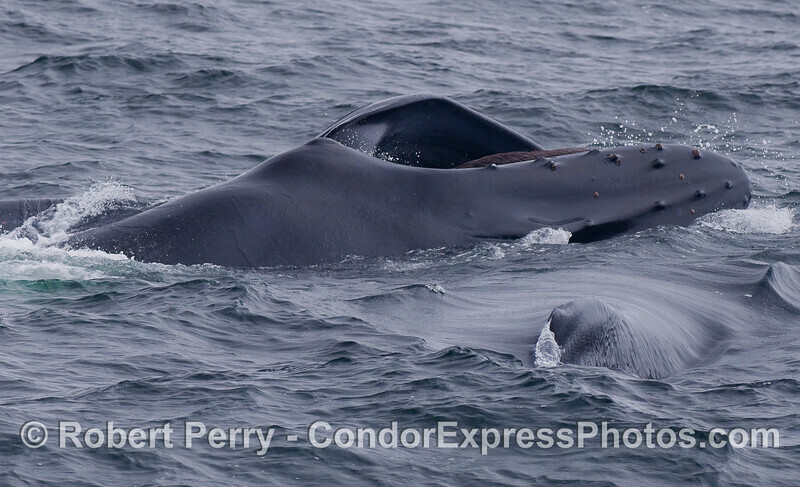 Two Humpback Whales, one is sideways lunge feeding on the surface. 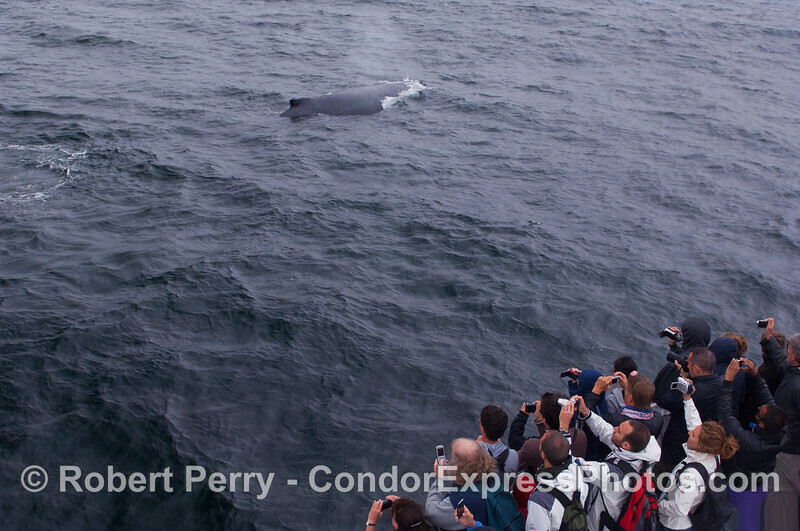 We are looking at the tip of the dorsal fin of the whale in the lower right corner, and the top of the head/rostrum of the upper whale. 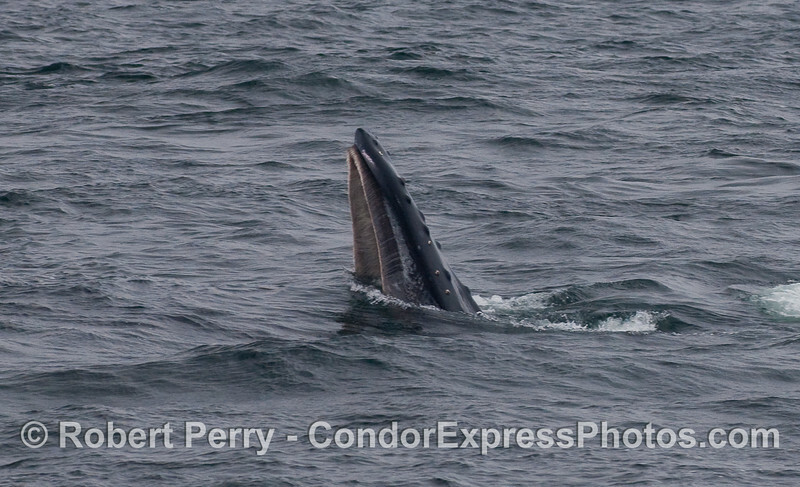 The mouth is open and baleen can be seen in the upper jaw. 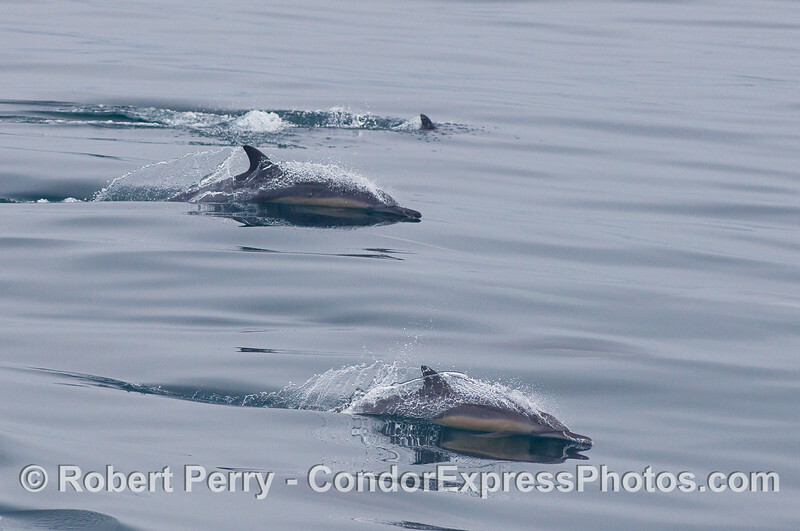 Common Dolphins come alongside for a look at the Condor Express whalers. 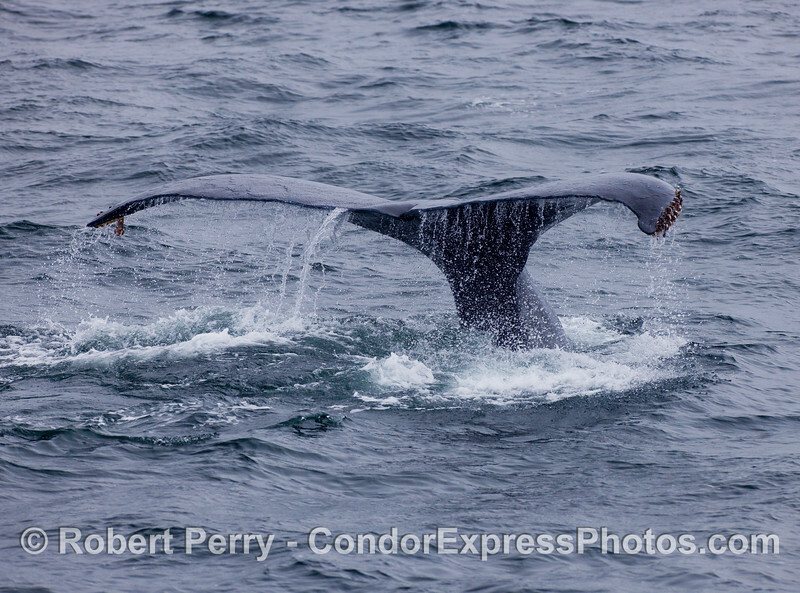 Surface lunge feeding Humpback Whale...left pectoral fin is shown to the left of the image. 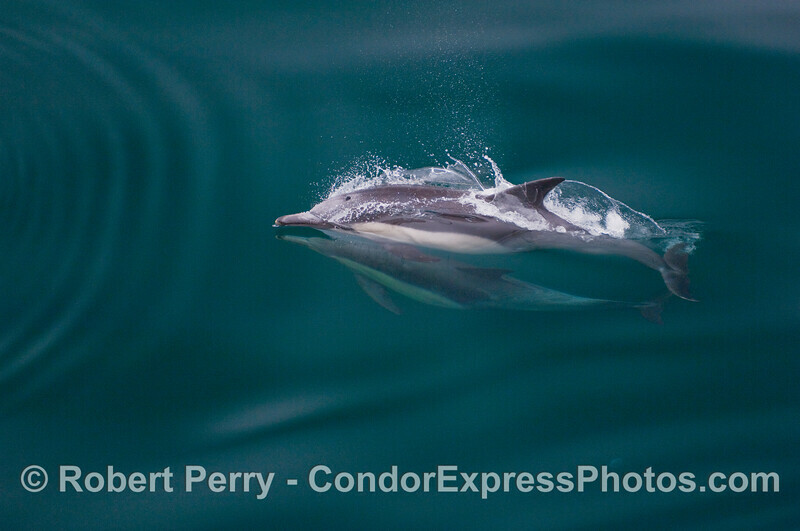 One frisky Common Dolphin leaps over another. 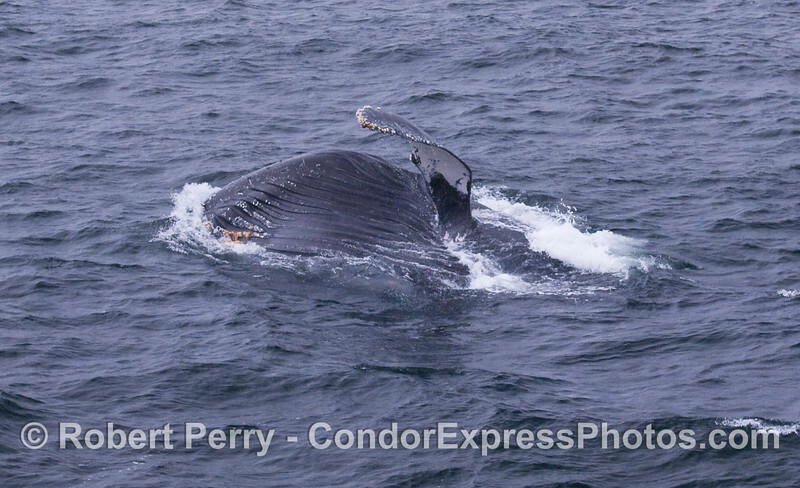 A nearly vertical surface lunge feeding maneuver by this hungry Humpback Whale. 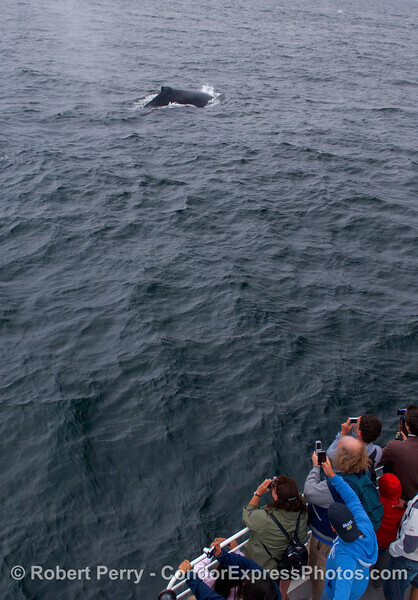 A look directly into the gaping mouth of a feeding Humpback Whale. The animal is on its side, upper jaw on the bottom and lower jaw greatly expanded on top. 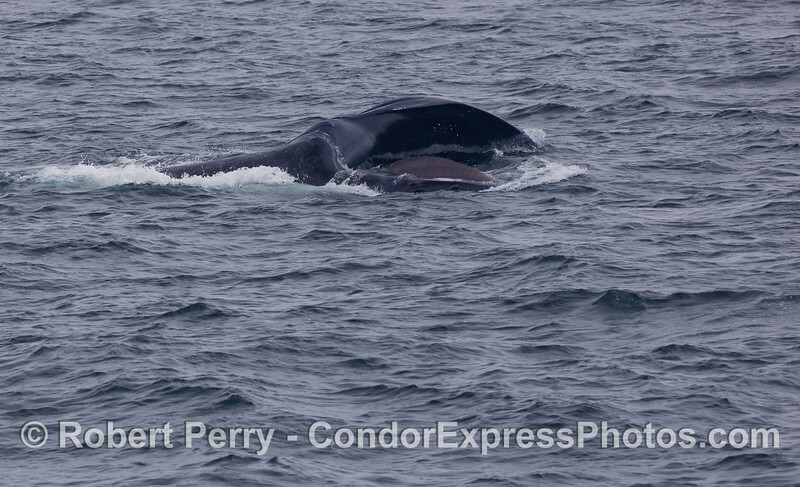 The dark reddish-brown baleen can be seen. 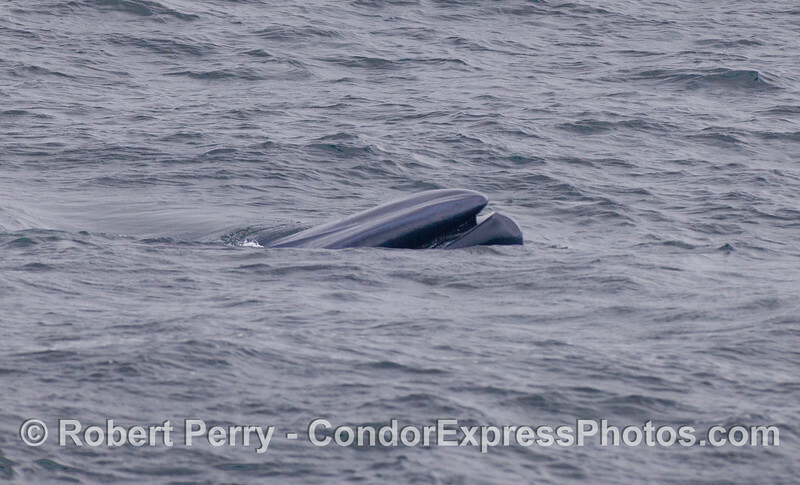 This Humpback Whale has rolled over and has its left pectoral fin in the air as it lunge feeds. The expanded ventral groove blubber is shown as the beast gulps a huge volume of seawater full of krill. 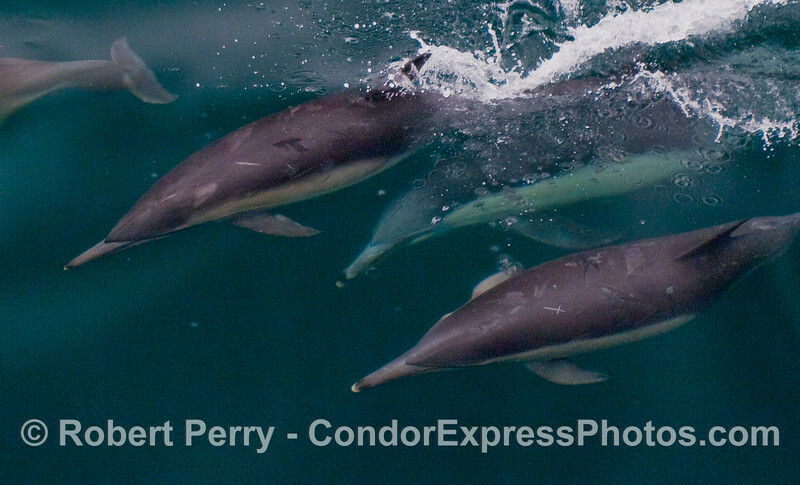 Close look at speedy Common Dolphins. 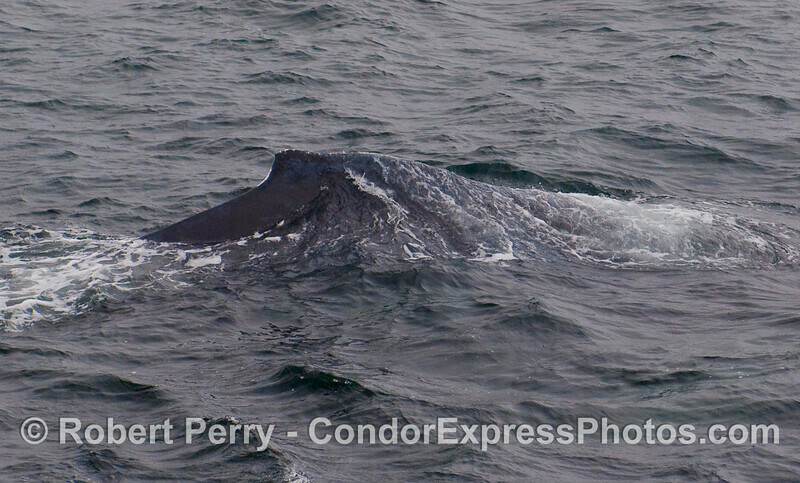 Dorsal fin and flanks of a giant Blue Whale. 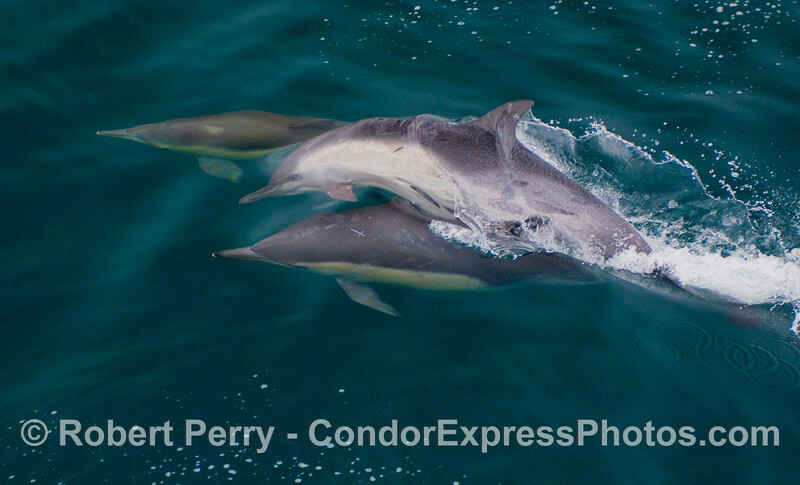 Common Dolphins under the clear blue water. 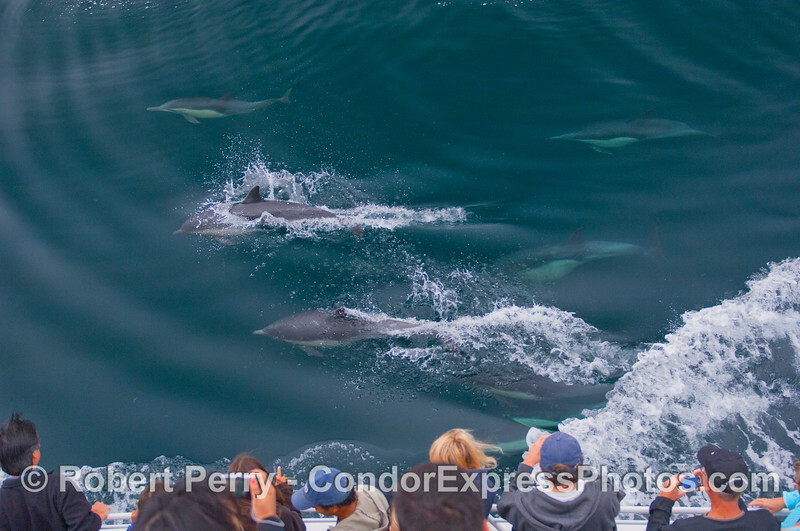 A group of Common Dolphins near the Condor Express and another leads the charge out front. Open mouth and tip of the rostrum of a Blue Whale. 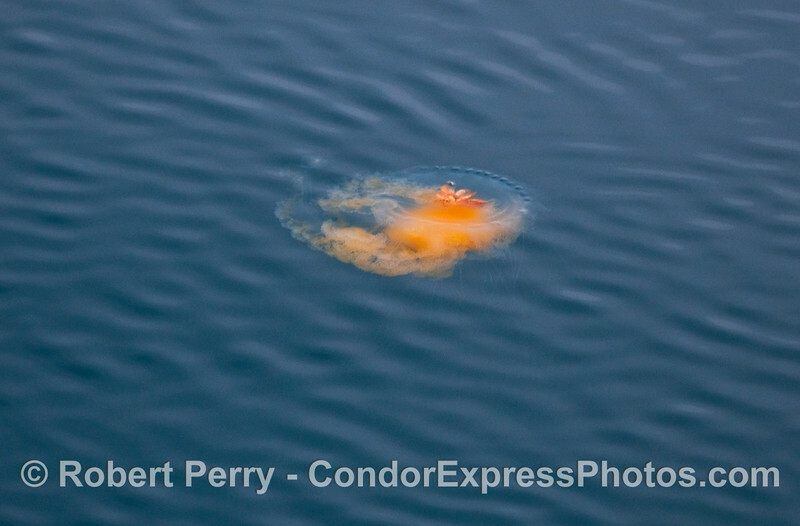 The "Fried Egg" or "Egg Yolk" Jelly (Chrysaora fuscescens). 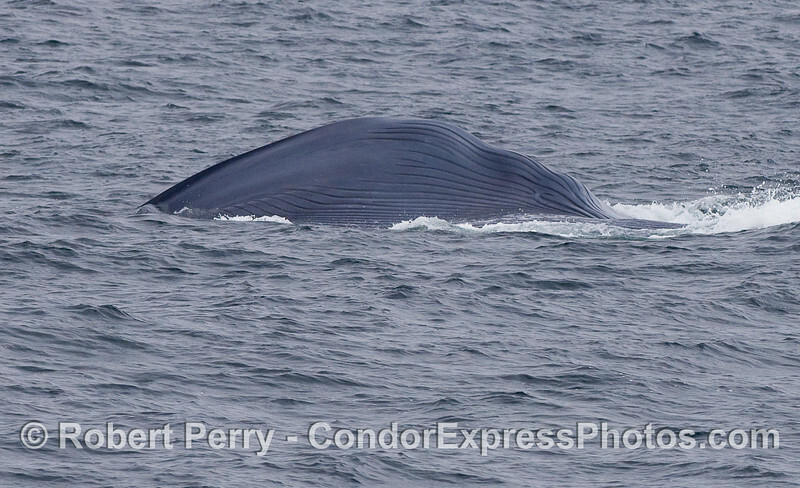 Another look at the tip of a Blue Whale's snout, mouth open slightly. 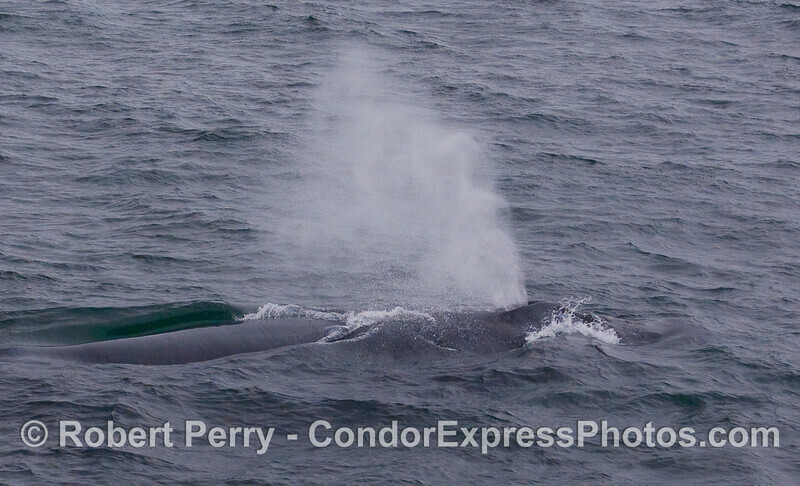 A tall spout from a mighty Blue Whale, moving from right to left. 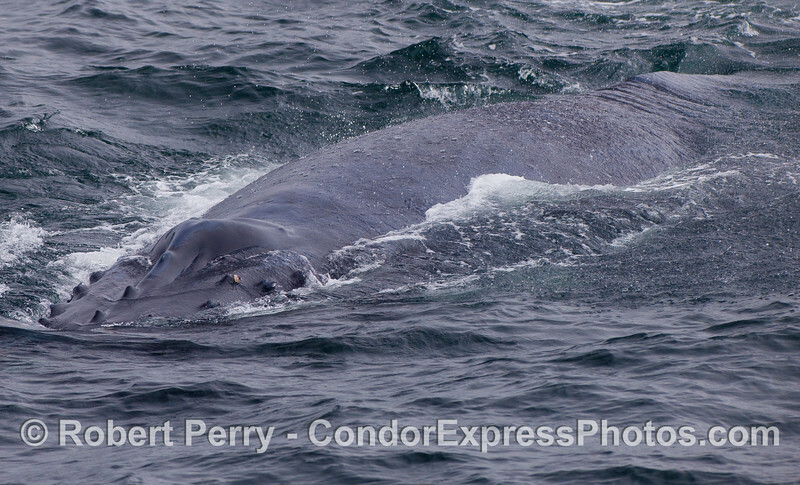 The underside of a lunge-feeding Blue Whale, showing its ventral groove blubber. The beast is moving from right to left, and has gulped an enormous volume of water and krill, which has expanded its ventral grooves. 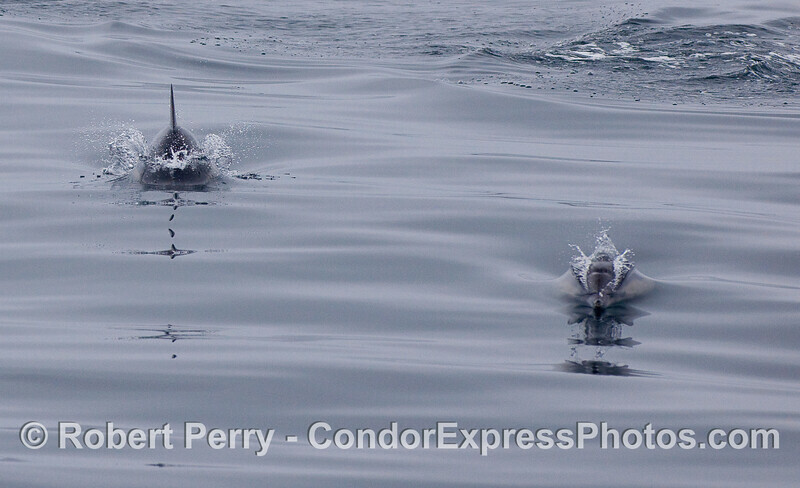 Common Dolphins coming at you. 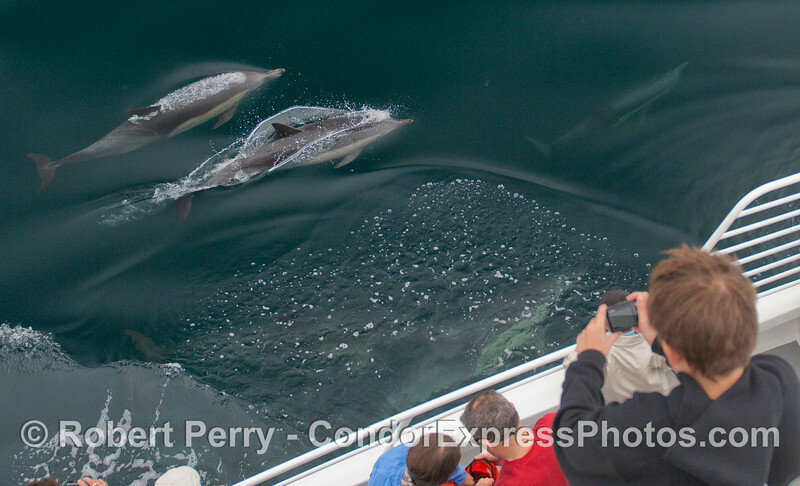 Common Dolphins streak across the mirror glass. 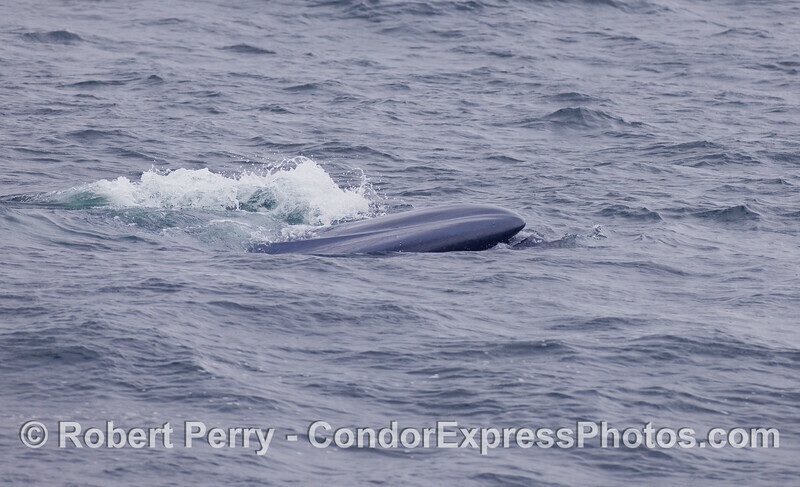 A lunge-feeding Blue Whale, upside down, exposes its ventral groove blubber and has its left pectoral fin in the air. 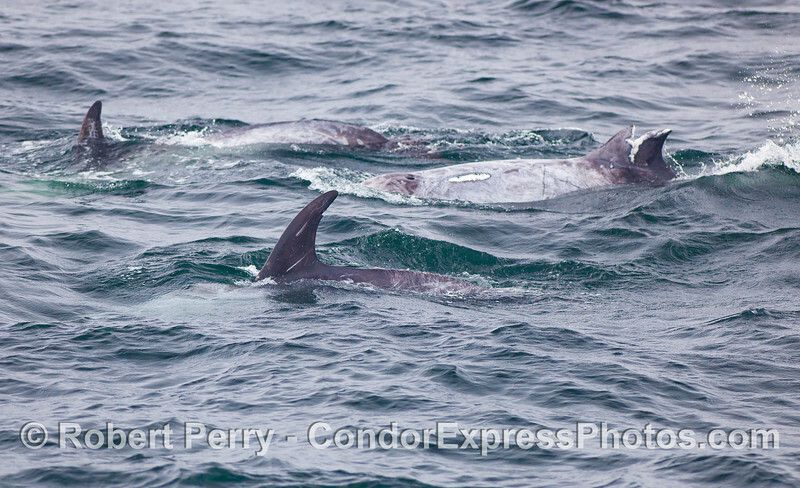 Three Risso's Dolphins, one with a damaged dorsal fin and scar on its back. 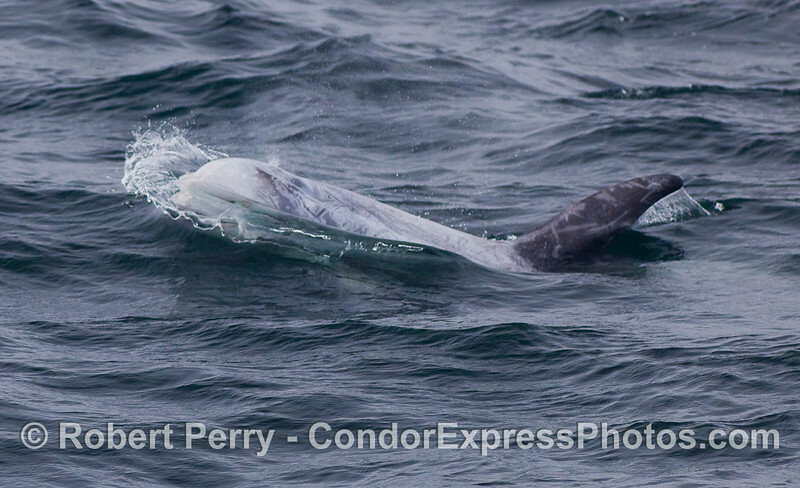 A Risso's Dolphin sends out a wave as its bulbous head moves through the water. 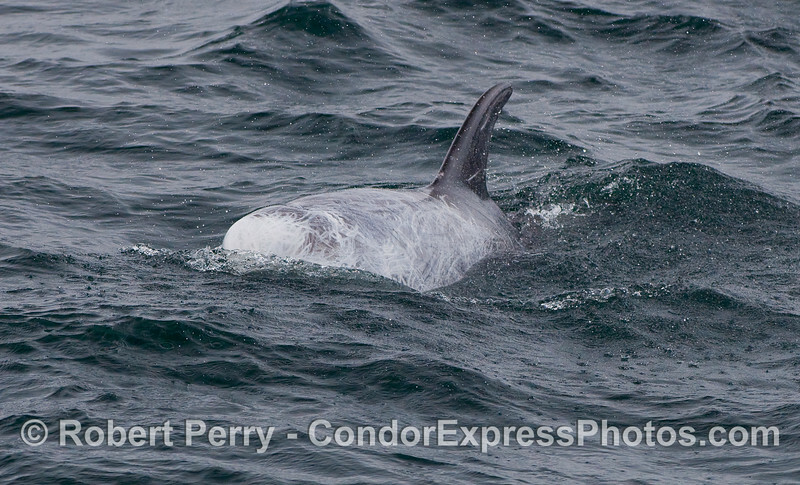 A Risso's Dolphin heads towards the camera lens. 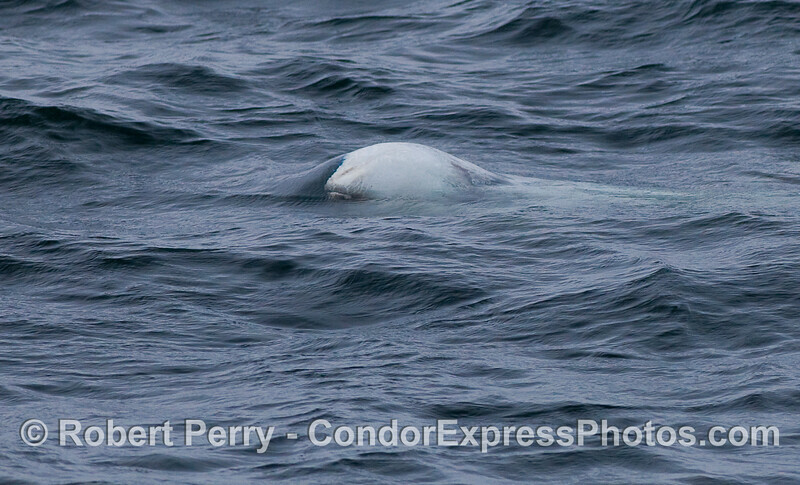 The round head of a Risso's Dolphin just beneath the surface, as it comes up to spout. 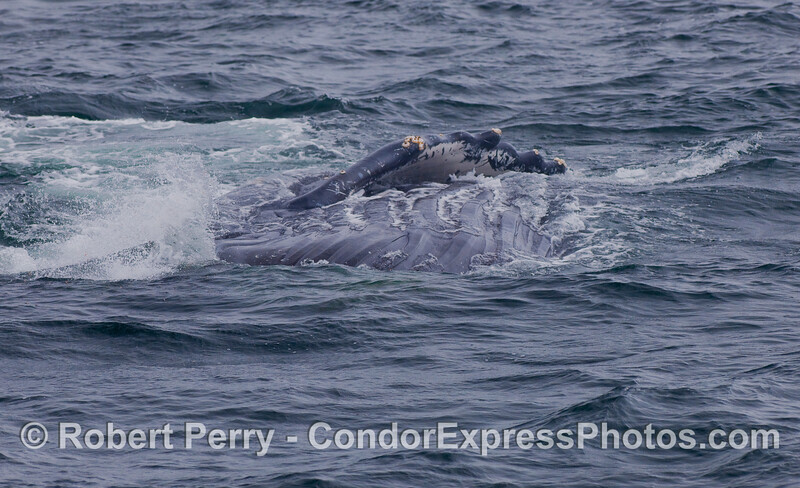 Whalers shoot a Humpback Whale. 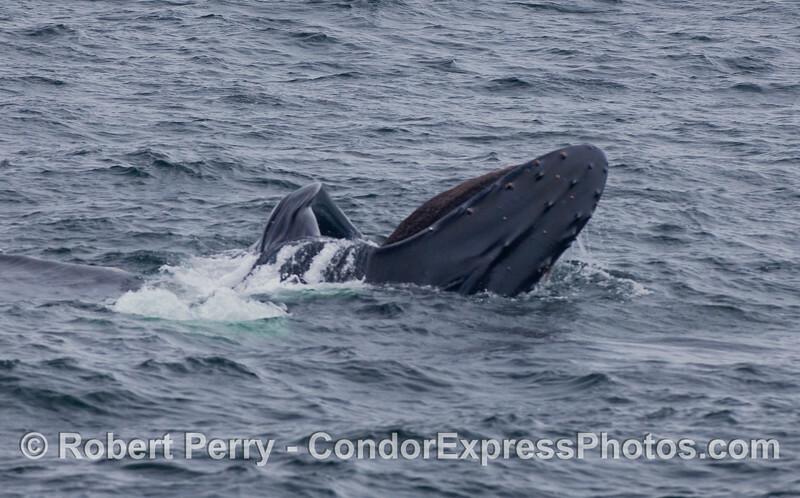 Two surface lunge-feeding Humpback Whales take gulps of krill directly in front of the whalers on the Condor Express. The farthest animal has taken in its food and has rolled over to show its ventral grooves. The nearest animal has its upper jaw and baleen out of the water as it lunges forward to feed. 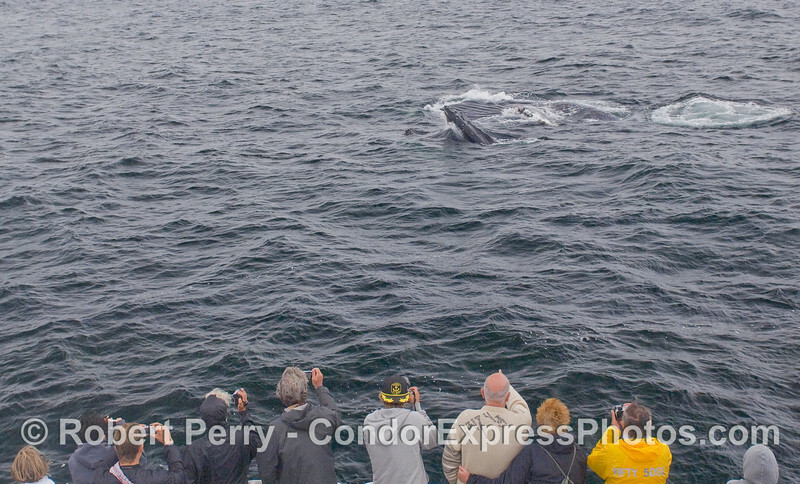 Feeding by two Humpback Whales so close to the boat is a rare privilege to experience. Image 1 of 2. 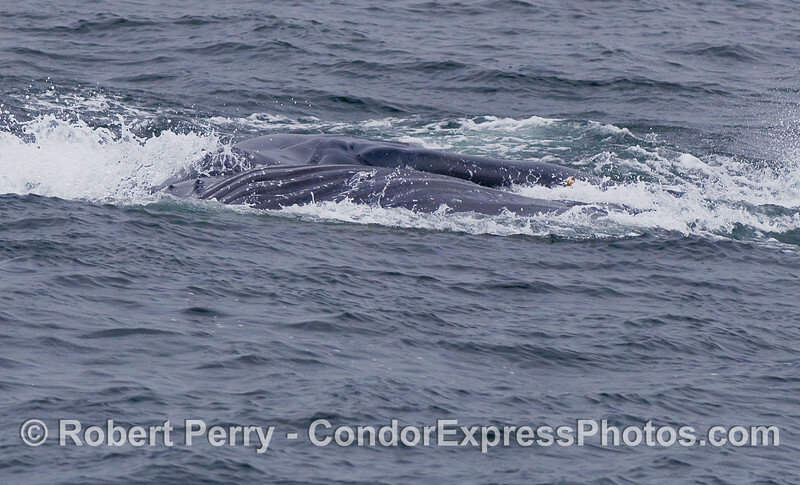 Another surface lunge-feeding Humpback Whale, moving from left to right, and laying on its left side. 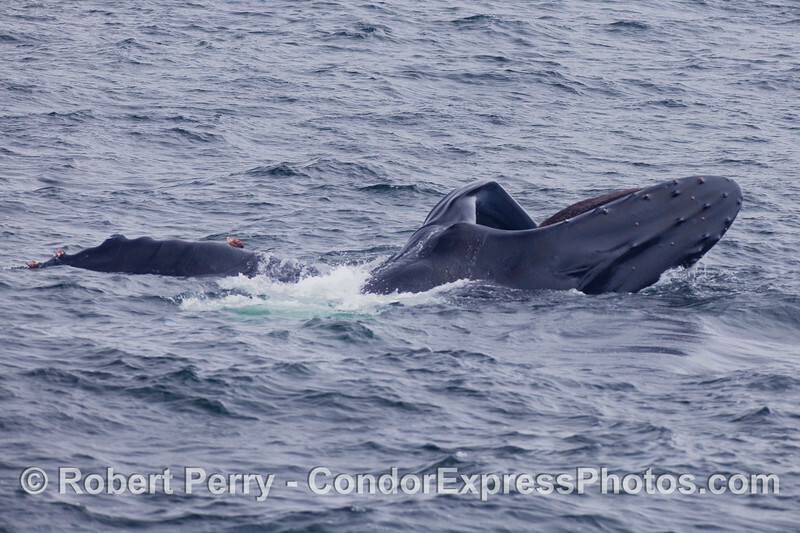 Two surface lunge-feeding Humpback Whales take gulps of krill directly in front of the whalers on the Condor Express. The farthest animal has taken in its food and has rolled over to show its ventral grooves. The nearest animal has its upper jaw and baleen out of the water as it lunges forward to feed. 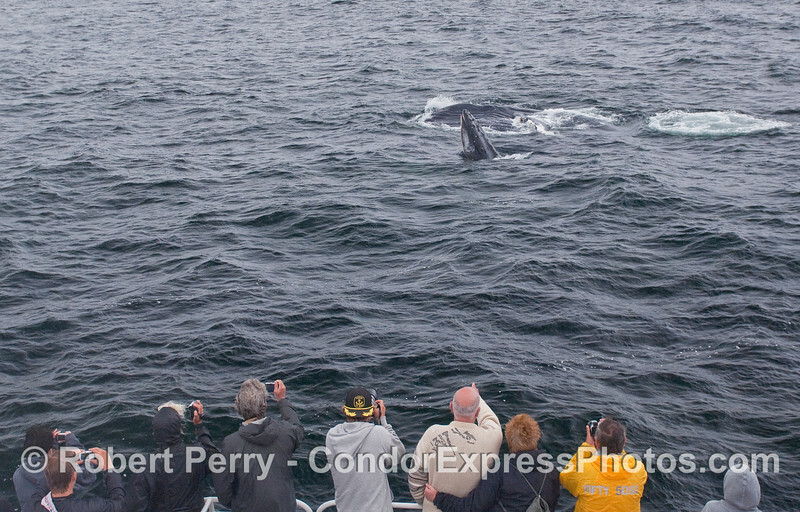 Feeding by two Humpback Whales so close to the boat is a rare privilege to experience. Image 2 of 2. 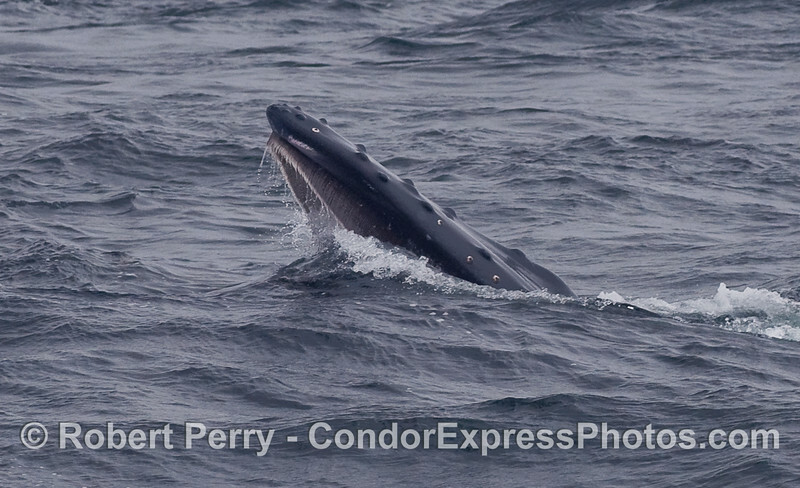 Close look at a Humpback Whale charging towards at the camera. 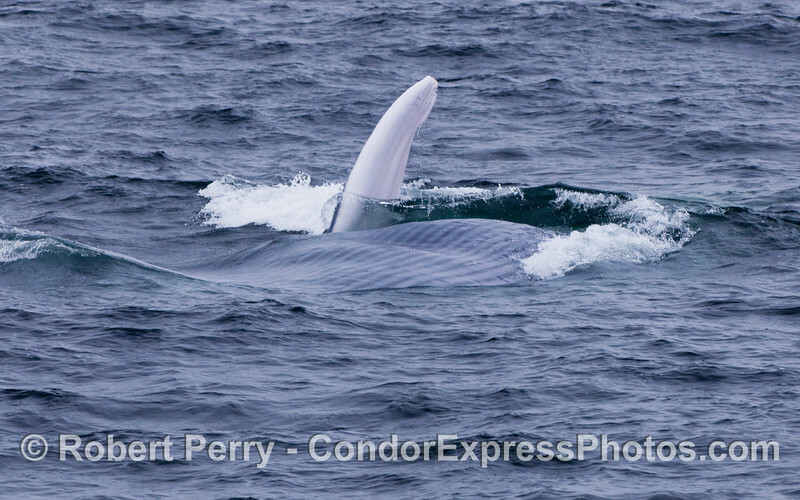 Like a snow capped mountain peak, the humpy, lumpy dorsal fin of a Humpback Whale is seen as it raises up out of the ocean. 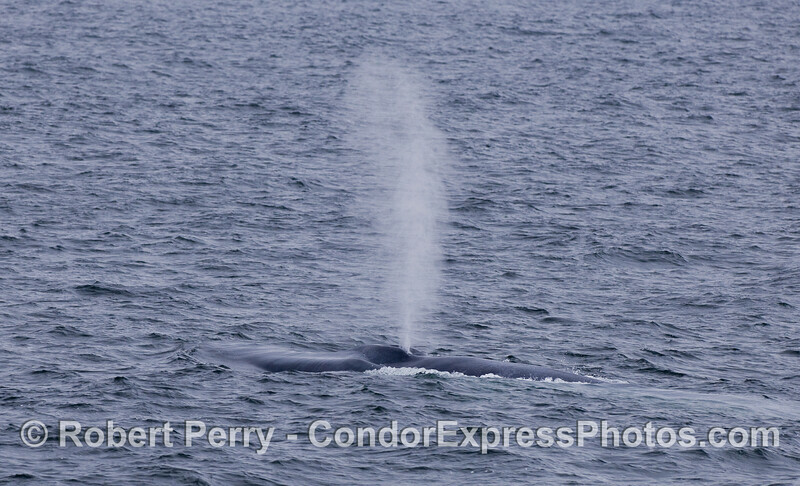 A Humpback Whale spout seen close up. Abstract whale sculpture: a Humpback is caught lunge-feeding on its right side, heading towards the camera. 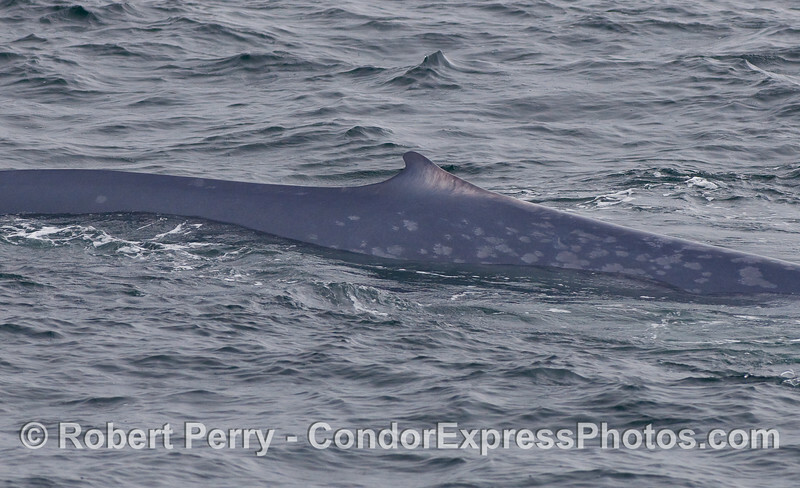 The expanded ventral groove blubber and knobby left pectoral fin can be seen close up. 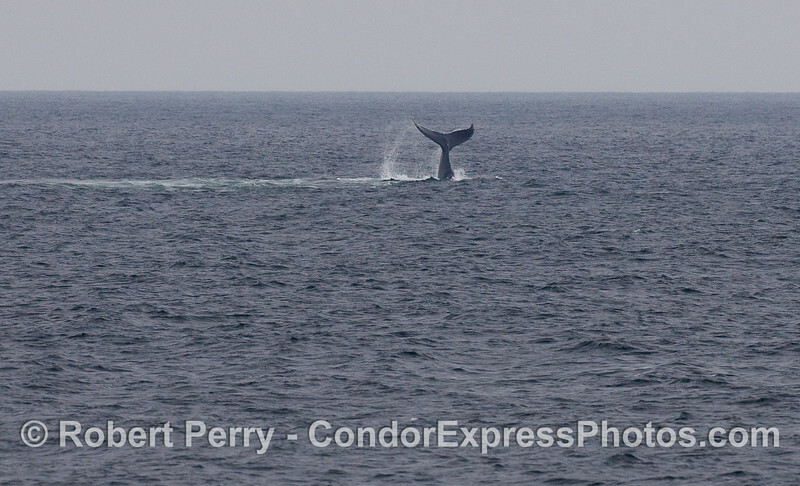 A Humpback Whale throws its tail around and makes a big scene on the water. 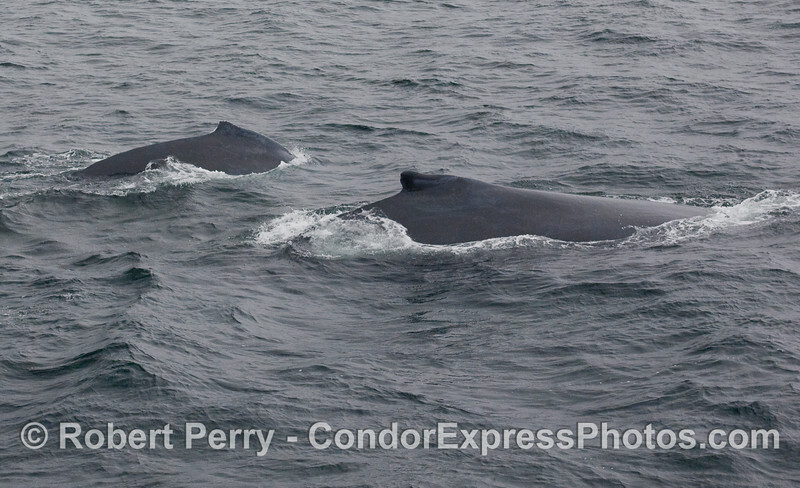 Two Humpback Whales, side by side.